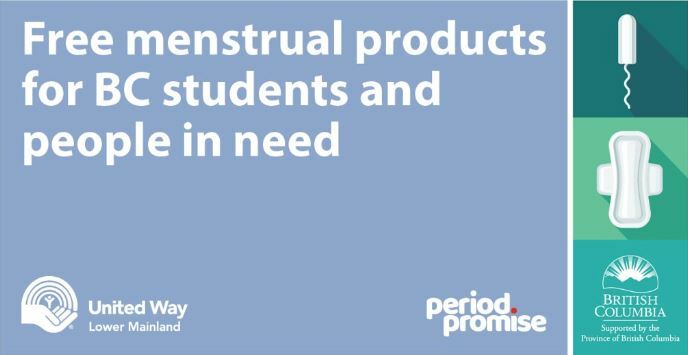 The Ministry of Education announced that all BC schools are now required to provide free menstrual products to students. Photo courtesy of the Government of British Columbia. BURNABY, B.C. – Free menstrual products for BC students are coming. According to an announcement from the provincial government, all BC public schools will now be required to provide free menstrual products by the end of 2019. The order was issued on Friday morning by Minister of Education Rob Fleming, and takes effect immediately but gives school districts until the end of the year to comply. The ministerial order comes with $300, 000 in provincial funding. “Students should never have to miss school, extracurricular, sports or social activities because they can’t afford or don’t have access to menstrual products,” Fleming said in the announcement. He added that one in seven students miss school due to their periods and not being able to afford products. The provincial government will work with school districts, community and education partners to look at each district’s needs and ensure they have the funding to meet the new requirement. The government will also provide a one-time grant of $95, 000, which will support the United Way Period Promise Research Project. The project will fund menstrual products for ten non-profit agencies and research into how they can better provide services and products for people who menstruate. “The cost and availability of menstrual products is a real concern for those who are poor and often face the choice of purchasing those products or buying other essentials, like food,” said Shane Simpson, Minister of Social Development and Poverty Reduction. The funding granted to United Way adds on to the government’s poverty reduction work.